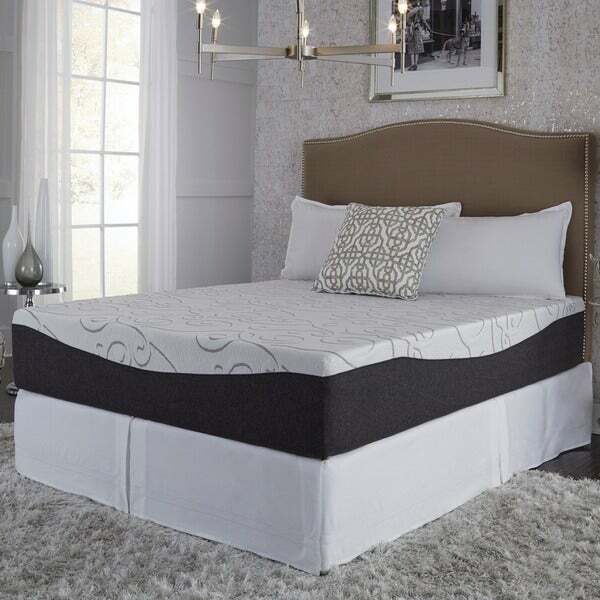 Northern Lights Collection by Slumber Solutions offers a unique cooling cover to keep you comfortable and cool throughout the night. This unique cover contains naturally cooling minerals interwoven with the threads of the fabric. This cooling fabric is cool to the touch and it stays cool. It won't wear off or wear out. The mattress covered by this cooling Northern Lights cover consists of our Gel memory foam, which also has cooling properties. The combination of these two components guarantees you will not toss and turn due to being hot and you will sleep comfortably the whole night. This luxurious sleep surface and mattress is just what you have been searching for - cool sleep on one of the best beds we offer. It's a win-win for you! Conveniently arrives tightly packed in a portable box. I purchased this mattress on clearance. 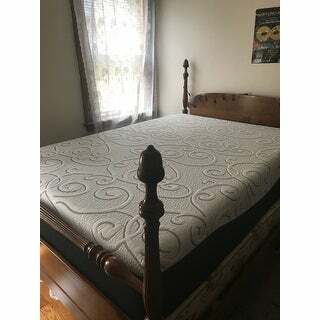 This is the second Gel Memory Foam Mattress we've purchased...this one is for our master BR though since we loved the other one so much. I noted that Northern Lights is a Slumber Solutions product and are made in the USA. That swayed my decision. I bought this as a gift for my dad who has back problems and has a hard time getting out of bed in the morning because of the pain. I was hesitant purching a mattress online but after reading reviews from multiple different sites I decided to pull the trigger. I thought anything would be better than what he had. I COULD NOT BE MORE HAPPY WITH MY DECISION TO PURCHASE THIS! My dad wanted a firm mattress, so I purchased the firm and after getting it all set up I was a little worried because it did not feel firm at all. But after laying on it the weight was distributed evenly and it felt more supportive. My dad isn't the best at expressing his feelings or showing his appreciation for things so when I got a text from him the next day saying I had the best night sleep I've had in 10 years I was almost brought to tears! He has thanked me numerous times and tells me how great he feels in the mornings. The only problem he has now is if he lays down just to watch TV he falls asleep without meaning to! I loved that this mattress was made in the USA. I purchased the mattress with the cooling cover because he gets really hot in the summer. The cover is definitely cooling, so in the winter we purchased thicker sheets for the mattress and it helps to stay warm. I am in need of a new mattress myself and will be purching the same for for myself soon. I can not say enough good things about this mattress and definitely recommend it! I am so happy with this purchase. I never had a gel / memory foam mattress but now I can never go back. Some of the deepest sleeps and feeling so rested in the morning. Definitely recommend. My son, 150lb teenager had back pain issues due to a pillow top mattress. One week after sleeping on this beauty his problems were gone! He sleeps on it for two months now and loves it because he doesn't get hot, the material is truly cool to the touch when through the sheets. It arrived in 4 days after the purchase and looks beautiful. We're very happy with the purchase! Once I was able to lug the mattress up to my second floor, and get it situated on top of my box spring, the mattress expanded quickly and I was able to sleep on it the same night. Make your life easier: DO NOT cut the mattress out of the packaging until you have it in place! With all that said, I love this mattress! I’ve been sleeping deeply and soundly on it, and I’m very pleased with my purchase. Due to the softness of the gel foam, it’s a bit challenging to prop myself up to sit up and lounge in bed, but I’ve made the adjustment, and getting along just fine. I decided to try this mattress because the price was right and I found myself suffering from pressure point pain quite a bit. My hips and shoulders often ached and the pain woke me up at night. I felt like I needed more cushioning. I've been sleeping on it now for about a week and really notice the difference. No more pain. Since I'm barely 100 lbs,, I picked the medium cushioning. I'm glad I did. A very heavy person might find he/she sinks too much and for older people like me, I imagine it could get a little tricky getting in and out of bed. 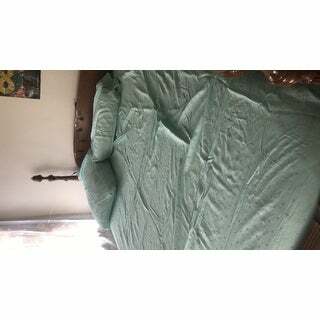 The upper layer is gel and it really keeps the sheets cool. I haven't used it on hot summer nights, but I think the gel does mitigate the fact that memory foam doesn't breathe very well and retains body heat. In retrospect, I probably could have settled for a thinner mattress and done just as well. It also is easy to adjust and move, but I have a twin size and could see that queen or king sizes would be awkward to handle. It inflated to full size within an hour. The cover is very attractive and appears water repellent. I think we'll do fine together. These mattresses are very comfortable and do not sleep hot as some memory foam mattresses do. Overall, I’m more than happy with the purchase. Perfect bed. If you like a softer bed not a firm bed this is one for you! So comfortable and is shipped in a really cool bag so it’s easier to take to whatever room you need the bed in! I really like this mattress! I purchased medium one and it’s accidentally on the softer side. Still enough support for me (130lb) and my husband (160lb). The mattress got expanded right away and didn’t have any odor from gassing. I think I slept cooler than usual and even more comfortable than on my more expensive mattress. I am very pleased with the purchase. This is really comfortable. I’m a belly and side sleeper. My hubby is a back and side sleeper. We BOTH are sleeping comfortably and my lower back feels much better after a week on this mattress. So glad we decided to purchase it. Great price. Delivery was fast. Opening it up was easy. Odor was minimal. Got this as a gift for my daughter. She seems to be happy with it no complaints. Back is feeling better. I bought this mattress in Firm for my 10 year old daughter who was having neck pain problems with her previous mattress. The mattress did not seem terribly firm when I laid on it. It has plenty of give. Her neck seems to be feeling better though so I have no complaints. This is the best mattress we have ever owned, it is what the manufacturer has said it was. It is holding up well and there are no sagging in the mattes well. Mattress arrived sooner than expected. It unfilled and took shape immediately. I could also feel the cool feel if it until I put flannel sheets and flannel pajamas on. I read reviews of a smell, but I didn't smell anything at all. No need to febreeze. I have noticed it's gotten softer the past couple of days, but I can't quite say it's a plush feel. I would say if you want a plush feel you need a pillow top, not memory foam. It's definitely better than the firm I was on. this bed is more comfortable than the Tempurpedic I just traded it in for. Great value! We recently redid our two teenager daughters' bedrooms, got them each a double bed, etc. We bought them each this mattress and they have never slept better or raved more! Very pleased with our purchase of these 2 mattresses! So far so good. I thought it would be a little more plush but it has been fine. Love this mattress so much I bought 2! "Does this mattress come with a box springs or do I have to get those separate"
No, the box spring is not included. These mattresses are made to be used with or without a box spring as long as there is adequate support for the mattress when in use. "What is the 10 year mattress service plan?" "Will this mattress be good for my husband and I, who are both heavier people? We are debating between the 12 or 14 inch." We recommend referring to consumer reviews to determine if the mattress will suit your needs. "will this mattress work on an adjustable bed frame?" Because it had good reviews. "What is the policy if the mattress is defective? I have purchased this type of mattress (similar, comes compressed) and the mattress did not fully expand on the corners." "Is this returnable, as many mattress have a trial period, if it does NOT help with a chronic painful back and hip?" Unfortunately no, after opening this item is non returnable.